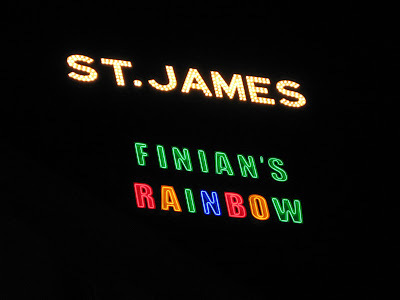 Today, I'm taking my Mom to see Finian's Rainbow. Sadly, it's the last performance of a beautiful, if too short run of this revival that began last fall at the St. James Theatre under the direction of Warren Carlyle. The tuner is by It was the best reviewed show of the season so far and its leading lady, Kate Baldwin, gave a star turn for the ages. Helping her grandly were Cheyenne Jackson, Jim Norton, Terri White, Christopher Fitzgerald, Chuck Cooper, David, Schramm, William Youmans, Guy Davis, Alina Fay, Brian Reddy, Tanya Birl, Christopher Borger, Meggie Cansler, Bernard Dotson, Leslie Donna Flesner, Sara Jean Ford, Taylor Frey, Lisa Gajda, Kearran Giovanni, Tim Hartmam, Tyrick Wiltez Jones, Kevin Ligon, Monica L. Patton, Joe Aaron Reid, Devin Richards, Steve Schepis, Rashidra Scott, Paige Simunovich, James Stovall, Lauren Lim Jackson, Grasan Kingsberry, Elisa Van Duyne, Aaron Bantum, Brian Sears, and Elisa Van Duyne. Fortunately, this cast has recorded an album of this glorious music by Burton Lane and E.Y. Harburg. It's available for pre-order. It's song after song of pure joy. I saw it last night and was disappointed that Cheyenne Jackson skipped the performance, though his understudy Brian Sears was excellent. I understand he also missed Friday night and the Saturday matinee. Did Cheyenne make the last performance? I heard that Cheyenne had already committed to concerts in CA w/ Michael Feinstein - you may know that they recorded an album together. He was there at the last performance. I find him an even performer and I do like his glorious voice, but he's not inspiring in any particular way. I find it very disappointing to discover that a musical entitled American Idiot featuring the songs of Green Day is replacing Finian's Rainbow with Kate Baldwin. Do you have plans to see this new offering? I am certainly not looking forward to it or its success. Hi Tyler - Broadway is a business after all.